This December, exhibit your work at the premier showcase for international, contemporary art. 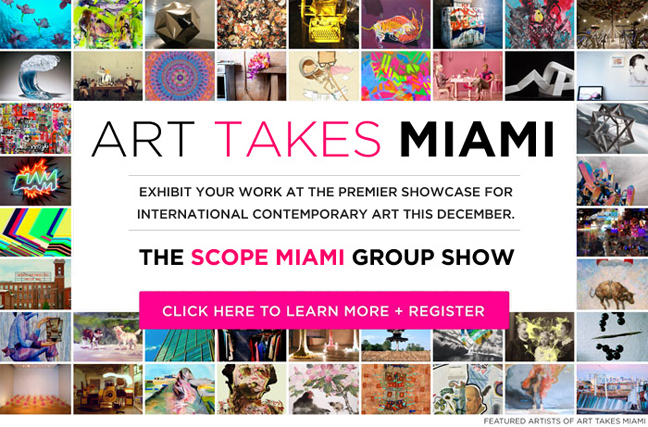 SCOPE Art Show, Artists Wanted and See // Exhibition invite you to submit your best work to Art Takes Miami for a chance at $10,000 and your own exhibition in an exclusive, featured booth at SCOPE Miami this December. Entries received before the standard deadline will be the first to be reviewed for future artist features published through our newsletter and social media pages. The Grand Prize Artist will be selected by Alexis Hubshman, Founder of SCOPE Art Show; and Daria Brit Greene, SCOPE Vice President. Category Award winners will be determined by: David McFadden, Chief Curator at Museum of Art and Design; Liz Thompson, Publicity Director at Phaidon; Evan Pricco, Editor in Chief at Juxtapoz; Sabrina Y. Smith, Curatorial Advisor at Ground Magazine. Your Standard Entry Deadline is Thursday October 31, 2013.